Oil prices are still nearly 50% off their peak, and it's sparking the interest of value investors. 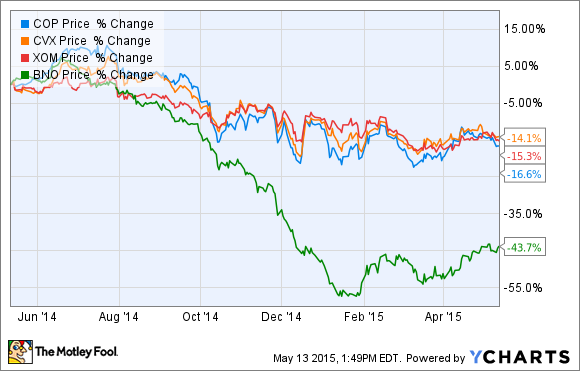 Here’s how to invest money in oil, not only for the rebound, but for the long term. My, how times have changed. It was just a couple of years ago that the world was worried about peak oil. Now, we have too much of the stuff. That shift has created enormous volatility in oil prices, sending them on a couple of round-trips to triple-digit territory before falling back again. This volatility is something investors really need to have a handle on before even investing a dime in a stock related to oil. As the most recent downturn in oil prices demonstrated (it sent oil prices down by more than 50% in less than six months), volatility can happen without warning, and it can be extreme. Further, that downturn sent many oil stocks cratering well beyond the 50% plunge in crude prices, which reiterates the fact that not all oil companies are the same. With that warning out of the way and the inherent risks in mind, here are a few ways to invest money in oil. 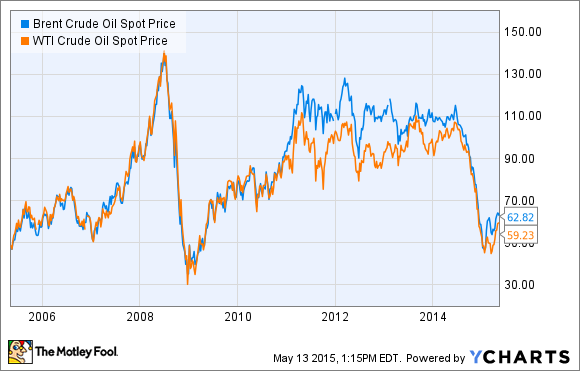 Two factors drive oil prices: Supply and demand. When one, or both, get out of balance, it can lead to a dramatic repricing of oil. Over the past few years, oil supplies have been buoyed by surging U.S. oil production as oil companies in the country figured out how to unlock oil trapped in tight rock formations. This led to a dramatic turnaround in U.S. oil production, which reversed years of declines, as we see on the chart below. 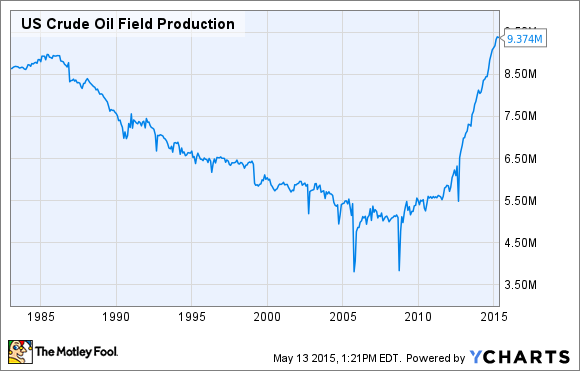 U.S. Crude Oil Field Production data by YCharts. One of the reasons production grew so sharply is because once the code was cracked, entrepreneurially-driven independent oil and gas companies took control and drilled wells as fast as they could. Many drilled faster than they should, as they borrowed billions of dollars to acquire acreage and drill wells. Eventually, this caught up with the industry as once-robust demand, especially in Asia, began to wane, leading to an overabundance of oil on the market and crashed oil prices. All of that being said, these independent drillers offer investors remarkable growth potential. However, that growth comes at a cost, as these oil stocks can be much, much more volatile, especially those with a lot of debt. However, for investors seeking pure upside to a return of the black gold rush, independent oil companies are the way to go. There are literally hundreds to choose from, with leaders EOG Resources (NYSE:EOG) and Devon Energy (NYSE:DVN) at the top, and countless others along the way down. At the other end of the spectrum are Big Oil giants. These are well-know companies that include Chevron (NYSE:CVX), Exxon (NYSE:XOM), ConocoPhillips (NYSE:COP), and a small handful of other big names. These companies tend to have much stronger balance sheets, are geographically diversified, and typically pay strong dividends. What these companies don't offer very much of is growth, as their production tends to grow in the low single digits compared to the double-digit growth of smaller independents. However, despite that lack of growth, these companies offer investors stability, as none of these stocks dropped anywhere near as deeply as oil prices did over the past year. Because of this, Big Oil is a much less risky way to invest in oil. A third option, and in many cases an even less risky option, is to invest in companies that are the suppliers to the industry. This includes oilfield services companies like Schlumberger (NYSE:SLB) or Halliburton (NYSE:HAL), equipment makers like National Oilwell Varco (NYSE:NOV), and oil pipeline companies like Enbridge (NYSE:ENB). 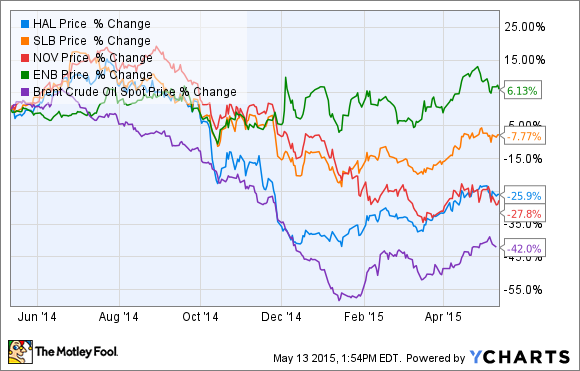 Again, like Big Oil, these stocks are much less volatile than the price of oil. In addition to that muted volatility, these stocks have another safeguard since they're not exposed to the operating risks of oil companies. Said another way, these stocks rise and fall with overall industry activity, whereas an oil company's operations might not be growing as fast as the industry because of weaker assets or a company's specific issue. Moreover, some of these companies, like Enbridge and other pipeline operators, have revenue that's secured by fee-based assets as opposed to the whims of commodity prices, making these companies less affected by the commodity cycle. Investors have a lot of options when it comes to investing in oil, and each option carries its own risks. That's why I like to spread risk around by diversifying within the sector and investing some money in a compelling independent oil company while hedging that bet with a big oil giant and a pick-and-shovel play. That, in my opinion, really is the smartest way to invest in oil, as it offers some of the upside from an independent while muting a bit of the risk thanks to the less risky names.